Taken by my good friend, Ashleigh Moore. Out on a photo walk, being assisted by Buddah. I’m married to a great guy, we have two beautiful and funny university aged daughters who recently have forbidden me from taking their photos without the involvement of extreme bribery. 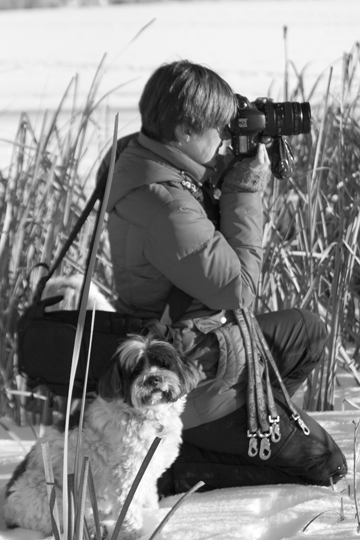 So…I was forced to move onto easier prey…my four Tibetan Terriers (TT’s) as my muse. I am sure if given the chance they would also put the kibosh on my excessive shutter clicking. Three of my four present dogs are adopted, Tashi 5, is a TT cross who came to us at 6 months of age through Northern Alberta Society for Animal Protection in Edmonton. Tashi has taught me a great deal about dog behaviour (both good and bad). Bella 10 and Buddha 8 are a bonded TT pair from Vancouver who came into our lives this past April through Tibetan Terrier Club of Canada Rescue; they are adapting to pack life and Alberta winters, slowly. Kaya 10, is the only remaining member of my original three member TT pack, SHE knows it and reminds everyone else whenever she can. I love all animals, especially dogs, and spent four years running a successful dog walking and pet sitting business. Now I have a part time gig capturing images of pets and the people who love them. One of my reasons for starting this blog is because of a project I’m starting in 2013; it’s my take on a 100 Strangers Photography Project. My goal is to take photos of 100 Pets and their People (all strangers) over the course of the year. I am very excited about this project and know it will help me grow as a photographer and individual. I also hope to share some of our adventures walking in the woods and excerpts from my photo shoots. This is going to be so much fun! Can’t wait to see how your 2013 project unfolds. Thank you Terri! I really hope it goes as well as I have planned in my head (or at least most of it lol). Thanks so much Barb! I haven’t seen her books but I’m going to check them out; I have some gift certificates to our Chapters store and they sound fantastic. I hope I can keep track of all the pets, people and stories properly and do them justice. I’ve ordered mini Moo cards to give to the people with my website and a thank you for helping me with my project so they can check out the gallery. I’ve decided if they would like a copy they can send me their address and I’ll send them one, for free of course. Barb I have quite an array of clothing from my dog walker years. My coats start at waist level and get longer as it gets colder right down to mid calf. I have bought all of them through Lands End or LL Bean and several are down filled. I have great snow pants and long johns for when its really cold and the snow pants come in handy when I lay in the snow to get a shot lol. I wear insulated Muck Boots or Sorels and mitts and a hat. Layers are the key for sure and because I walk mainly in the woods I don’t have to deal with much ice but I do have things to slip on my boots if necessary for traction. I put a product called Mushers Secret on my dogs paws so they don’t ice and snow ball up. Are winters are everywhere from about +8 celsius to -30 celsius and then sometimes a windchill on top so there are no other options really 🙂 I have an active bunch of pups, especially Tashi. Hope that helps! Thanks so much Rosemary! My dog Kaya is black and I have the same issue, she needs snow on her face to get a good photo or a good background (she looks good in green :)). I’m excited about the project. I have nominated you for the WordPress Family Award. You can read all about it here: http://thek9harperlee.wordpress.com/2013/04/30/we-are-fam-i-ly-get-up-everybody-and-dance/. I love your project and getting to meet all the pets through your lovely photos and stories. Thank you!